Writing group statements, like writing joint letters, is never easy, particularly when it is done under the pressure of time and events. Good writing also never comes from committees. But I am happy that the statement that five of us released yesterday about Labour’s Economic Advisory Committee (EAC) expresses what I wanted to say. But from interchanges on twitter it is clear that people read things in different ways, so I thought it might be useful if I explain why I am happy with it. Needless to say what follows are my own views and may not be those of my colleagues who signed it. There were some who, when the EAC was set up, said it was just for show and would have no impact. In my own area of fiscal policy rules that proved to be completely unfounded. The EAC was important in creating Labour’s new fiscal credibility rule, which brings fiscal rules in line with mainstream monetary and fiscal policy in an age where liquidity traps can easily occur. When I accepted an invitation to be part of the committee I was heavily criticised by some for ‘providing legitimacy’ to particular politicians they did not like. I replied at the time that no endorsement of individuals was requested or given (the first sentence above), but also that any legitimacy that may have been obtained was more than offset by a vulnerability that comes from the freedom of EAC members to criticise decisions if we wished. That is of course what the second sentence does. How do I justify this criticism? Again I must stress this is just my personal view. I have written right from the early stages of the Brexit campaign that I saw this as about the benefits that many people saw in being able to control EU migration, and weighing this against the economic cost in doing so by losing access to the single market. It was vital therefore to take seriously the warnings of economists that these costs could well be large. Jeremy Corbyn however seemed to suggest that when these warnings were repeated by the Chancellor they should not be believed because he could not be trusted. I doubt that was critical to the result, but it was nevertheless a serious economic, tactical and political error. The final point I want to make is what was not said. We did not resign from the EAC, as Danny Blanchflower has done. Again speaking personally I have always stressed that it should be possible, and indeed it is vital, for economists to give economic advice to politicians without having to endorse all their policies or capabilities, just as a medic or climate scientist might do. Resigning in this case would have been inconsistent with that view, which is why I did not take that step. I am also happy to remain part of the independent Kerslake review of the Treasury, which will report later this year. Despite misleading reports suggesting otherwise, Thomas Piketty resigned over two weeks ago because of the pressure of other commitments. When I suggested after the vote a possible way that Brexit might be avoided, I was conscious that I might simply be in denial. I have subsequently been encouraged by others suggesting similar things - first Jolyon Maugham, then Nick Pearce and Gideon Rachman in the FT - but of course they may also be in denial. If you ask a Conservative or Labour politician right now they will say that the referendum result must be respected: to do otherwise appears to disrespect voters. Equally European politicians want to make it clear as quickly as possible that there will be no extra concessions to avoid encouraging other exit movements. That is why delaying Article 50 for at least a month or two is so important. It allows the immediate passion of the vote to die down, and its immediate economic consequences to sink in. Hopefully that will also discourage other EU countries from going down the same route. By September it will also become obvious to people in the UK that as part of bargaining with the EU it might be a good idea to keep delaying implementing Article 50, and this may also encourage European governments to think about concessions. Maybe. I don’t think Boris Johnson would have any problems going down that path, once he was elected leader. (In the meantime he will continue to imagine we can have the impossible, because it allows him to get the votes of MPs in his party who are hardline Leavers.) But what about Labour - assuming it still exists of course. Will it worry about losing its ‘heartlands’, and so be tempted to insist that the referendum means free movement is no longer an option? I think this would be a disastrous political error. Whatever they might propose in the form of controlling EU immigration, they will be outdone by UKIP. That part of the heartlands that really dislikes foreigners are lost to Labour and will not return. (Of course many Conservative voters share similar views.) But if Labour appear to block free movement (and therefore continued EU membership) they will lose a large section of the electorate who voted to Remain. (Remember most Labour voters did vote Remain.) If Labour rejects free movement in any substantive sense, and therefore denies the possibility of remaining, many of these voters will go to the LibDems or elsewhere. The best Labour can hope for, when it comes to the heartlands, is to capture the many voters who dislike immigration not for itself, but because of what they believe it creates: more competition for public services, and worse working conditions. (For the majority of Leavers immigration is a fear rather than a direct experience.) Labour can target those voters in two ways: by promising more money for public services across the board, but also by proposing a substantial and very visible scheme by which money follows people. This is also a critical point for anyone aspiring to be Labour leader. Labour heartlands are now the cosmopolitan cities like London, Manchester and Bristol. They see the personal benefits of migration and being part of the EU. They have no problem with, and many happily embrace, policies that divert more resources to public services and the lower paid. But they are highly mobile in the political as well as the geographical sense. If a Labour leader tries to appeal to both this group and voters that want above all else to control EU migration by leaving the EU, then they will fail. 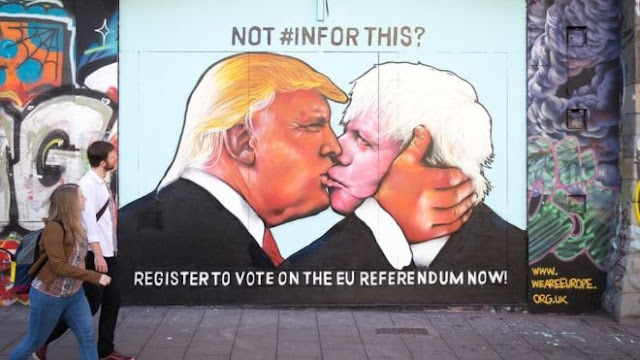 In the chaos that has resulted from the Brexit vote, not enough has been written about how this will almost certainly mean that we will have as Prime Minister someone who in many respects could be described as a British Donald Trump. They both benefited from privilege: in the US case with a large fortune and in the British case through class. They are both populists who gained and enhanced their popularity through the media, and most of the media loves them. They both have a habit of mendacity: you could almost imagine Johnson saying that the promise of £350 million a week extra for the NHS was ‘just a suggestion’. Nick Clegg, former Deputy Prime Minister, has described Johnson as like ‘Trump with a thesaurus’ when he says whatever he wants to win the Brexit vote. In other circumstances you might think this kind of language was distorted by some personal animosity, but unfortunately it all rings true. Johnson has been sacked from two jobs for lying. As Sonia Purnell, who has written a biography of Johnson, says: “Voters, feeling lied to and let down, yearn to be able to believe in their politicians again. But Johnson, for all his claims to be an authentic alternative, is more the problem than the answer.” These traits were very evident in the Brexit campaign: he was happy to let lies like Turkey was about to join the EU pass if they helped him win. As late as February, Johnson was saying that leaving would embroil “the government for several years in a fiddly process of negotiating new arrangements, so diverting energy from the real problems of this country”. Instead his championing of the Brexit side derived from political opportunism. To be elected leader of the Conservative Party you have first to be chosen as one of two candidates by MPs. Before the referendum, although he was very popular among party members, he seemed not to have a great following among MPs, just as Trump is not popular among senior Republicans. Coming out in favour of Brexit changed that overnight. Once he had won and deposed David Cameron, he did not attempt to dispel the uncertainty he had created but preferred to firm up his chances in the forthcoming election for leader of the Conservative Party, and therefore become Prime Minister. Boris Johnson plays the cultured aristocratic fool, and many love him for that. But if he becomes Prime Minister, as now seems almost certain, it may be the British public that ends up feeling played and foolish. Just how bad will Brexit be, and can it be undone? Mediamacro love their focus on ‘the markets’, and this leads to talk that makes Brexit sound like a major financial crisis. It almost certainly is not that. At the heart of Brexit is an act of self-harm to the UK’s trading industry (including, and perhaps especially, trade in services). But this is something that will evolve over the medium term as we gradually lose the benefits of the single market. It essentially means it will become more difficult for UK firms to sell stuff to the EU. Calculating the size of this effect is an exercise in trade economics not macroeconomics (see here for example). So it is not ‘intellectual arrogance’ to do this kind of analysis even if you think macro models have been a failure over the last 40 years. This decline in trade leads to a loss in productivity which makes UK citizens poorer over the medium term. It also means that the real value of sterling has to fall to make up for the fall in net exports (any decline in imports that result from leaving the single market will be less than the fall in exports). Other things being equal, this fall in sterling will happen immediately, as indeed it already has. This will make people poorer immediately, because imported goods cost more. But here the macroeconomics gets complicated. The hit to trade from leaving the single market will evolve gradually, but the fall in sterling is immediate. (The reason is something economists call UIP.) That means that trading firms might get a short term competitiveness boost, even though this will evaporate in the medium term. This may or may not be enough to compensate for the short term impact of rising prices on consumption spending. Unfortunately that is not all that happens in the short term. Uncertainty about future arrangements will hold back investment, and it may also add to the depreciation in sterling. For this and other reasons the short term impact on aggregate demand is likely to be negative, although measuring its size is difficult. We then need to think about whether the MPC will raise or cut interest rates. The National Institute’s analysis is very readable on all this. Mediamacro will focus on the short term. But the short term involves complex macroeconomics, so the size of the hit from Brexit is as uncertain as macro always is. I have always thought the medium term hit to UK incomes was both more serious and less uncertain. I was surprised at the extent of the negative global response to Brexit. After all, the direct impact of the UK’s misfortune on the world economy will be pretty small. I think it reflects something I wrote yesterday: Brexit is perhaps the first major casualty of the political populism that has followed the financial crisis and austerity. The worry is that it may not be the last. That a country can shoot its own economic foot is surprising but, as I explained above, not catastrophic. What worries me far more is the politics of it all. 75% of 18-24 year old voters wanted to remain in the EU. They are justifiably angry that the opportunities that the EU offered them have been taken away by the same generation that has increased their tuition fees and made house ownership an impossible dream. They, like many others, see their identity as being at the centre of Europe, not part of its political periphery. Scotland will not want to be ruled by an even more right wing government and be outside the EU. On the other side a large section of those who voted Leave did so on the basis of simple lies, and promises on which the campaign’s leaders cannot deliver, like much reduced immigration and more money for the NHS. This group are going to get more angry when this becomes apparent, and UKIP will only get stronger as a result. Although Boris Johnson might have initially wished that this referendum would secure him the Conservative Party leadership and negotiations leading to a second referendum, I cannot see the rest of the EU playing ball. It is also very difficult to see how the Conservative party and its MPs would allow him to do this without mass defections to UKIP. But a second referendum would not be necessary if, as a result of Cameron’s resignation, the UK fought a general election where the winning side explicitly campaigned not to invoke Article 50. This general election would become the second referendum. For this to happen three rather difficult but not impossible things have to happen. The first is that the Labour leadership need to stop talking about ‘respecting the will of the people’ and focus on how the Leave side are already owning up to their lies and false promises. The second, and perhaps most difficult, is that Labour need to form a united front on the basis of a Remain ticket, involving the LibDems, Greens and SNP. This is the only way the Conservatives and most of the tabloid press will be defeated. Third, the new Conservative leader has to be forced to hold a general election before Article 50 is invoked. Difficult, but not impossible. What is impossible is to try and remove Corbyn on the basis that he helped lose the referendum, for reasons I have explained before. In terms of those who should be blamed for the referendum result (Cameron, Osborne, Johnson, the tabloids, the BBC …. ), Corbyn’s role is marginal at best. Could you persuade Corbyn, Farron and Sturgeon to form an anti-Tory, pro-Remain alliance? Right now, as the horror of the Leave vote and a Johnson led Tory government become apparent, I think many party members could be convinced to do so, and that might put enough pressure on their leaders. It is, as far as I can see at the moment, the only way that Brexit, a right wing government led by our own version of Donald Trump, and perhaps the break up of the UK can be avoided. My reading of his article is that he thinks a second referendum route has more chance. But that would seem to require new concessions from the EU, and my own judgement (for what it is worth) is that this will just not happen. However the EU can still be helpful. The calls we saw from many (but notably not from Merkel) for a quick implementation of Article 50 are not. I also think they are misconceived from the EU's own perspective, which is to discourage calls for similar referenda in other countries. The best discouragement is to focus on the current chaos in the UK, and to hope that the UK eventually comes to its senses and overturns by some means the referendum result. Whichever route is taken, a big problem is pretext. How do you justify asking the electorate to overturn their earlier verdict? It may be true that many now wish to change their mind, but no one likes the feeling that they are being told they made the wrong choice. A deteriorating economy will help, but I still think you need something more concrete. Suggestions welcome. There is a lot of talk right now about an angry, mainly old working class who used Brexit as a way of kicking back at an establishment that had brought them nothing but grief over the last decade. The Leave campaign managed to channel that into anger at the EU, even though it had precious little to do with the EU. The key is to ask how did that happen, and why did it not happen just one year ago? In the 2015 general election Labour highlighted the decline in UK real wages, and promised more money for public services. They were defeated - no angry electorate wanting to get rid of the establishment then. Did that electorate feel passionate about European migration? UKIP only managed to get one MP elected. In 2015 the electorate voted Cameron back in because they thought the Conservatives were more competent at running the economy, and that Cameron would be a better leader than Miliband. In the last few hours we can clearly see that both beliefs are incorrect, and some of us said it back then. But that cannot be the whole story because that same leader with the same economic competence has just been heavily defeated. Did people just vote for the higher food and petrol prices that sterling’s depreciation will bring? Of course not. Nor did they vote for a possible recession. They did vote for lower immigration, but only in a small minority of cases because they dislike immigrants. People thought less immigration would lead to a better NHS, more secure jobs and higher real wages. They may get lower immigration, in time, but they will certainly will not get a better NHS and substantially better working conditions as a result. It is tragic that we have left the EU. But what is equally tragic is that people who voted for that are very quickly going to find out that they were sold a pig in a poke. They have been deceived, and that will only increase the disillusion and disenchantment with the political system. Of course we should blame Johnson and Farage and the rest: the UK has paid a very high price to facilitate political ambition. Of course we should blame Cameron and Osborne for taking the referendum gamble and stoking anger with austerity. But a few politicians alone are not capable of fooling the electorate so consistently. To do that they need to control the means of communicating information. In 2015 I argued that mediamacro had won it for Cameron and Osborne, and pretty well no one took this seriously. Just a year later, the united voice of economists has been successfully dismissed as Project Fear. Not by the people, but by politicians working together with most of the tabloid press, and a broadcast media obsessed with 'balance'. The tabloid press has groomed its readers for Brexit. If any good is to come out of this, it will involve defeating most of the tabloid press, and then forever reducing their influence. And given the power of that media, this can only be done by a united opposition that is prepared to cooperate in an effort to beat Johnson and Farage. There is also a very big warning here for the US. Clinton may be ahead now, but do not underestimate the power of the media (which is still giving Trump much more coverage) to turn that around. Brexit is perhaps the first major casualty of the political populism that has followed the financial crisis and austerity. That populism triumphed in the UK because the establishment underestimated its power and did nothing to tackle the resentment on which it feeds and the misinformation on which it thrives. It has been strong enough to turn a traditionally outward looking nation into one that turns its back on its neighbours. The leaders as well as the people of other countries should not make the same mistake as the UK just made. Why will around half of the UK vote for Brexit? The answer you will hear time and again is EU immigration. But why do people dislike EU immigration? Of course people fear the unfamiliar, and that is a fear that can be played upon, but is that really why people dislike EU immigration? Not according to this poll. More people think that EU immigration has been good for them personally than think the opposite. I’ll repeat that: more people think that EU immigration has been good for them personally than think the opposite. More people think the culture of Britain has been improved by EU immigration than the opposite. The reason people think EU migration has been bad for Britain is the impact on the NHS, and therefore by inference other public services. It is commonsense to many people that EU immigration increases the pressure on the NHS and public services, and it is confirmed by the newspapers they read: here is one example, and here are some more. What people miss is that EU migrants pay tax, which could fund public services. Indeed EU migrants tend to be young, so they are likely to pay more tax in than they are likely to take out from using public services. It is why the OBR believes that restrictions on immigration would hurt the public finances. Which means that in reality EU migration creates more resources that allows the government to spend more on the NHS and other public services. Not only do EU migrants pay for themselves in this respect, they also make access easier for natives. Add in the negative impact of making trade with the EU more difficult, and it is clear that Brexit would have a negative impact on public services. No wonder Dr Sarah Wollaston switched sides. Yet this is an argument David Cameron was reluctant to make, because it raises an obvious question. If EU migration is not the reason why the NHS is in crisis, what is? The answer is that his government has chosen to shrink the share of national income going to the NHS, when there are good reasons why this share should be rising. In other words the government has taken the taxes EU migrants pay, and used them to cut taxes or cut the deficit. Because Cameron will not make the case for why EU migration helps the NHS, that case is not heard by voters. Instead they are told all the time that the NHS has been 'protected'. Hence the poll result. Whatever happens today, this point is of vital importance. So many people will be telling both the government and the Labour party that the EU referendum - whatever the actual result - has shown that to win votes politicians must cut immigration. What the poll above suggests is that what people really want is a better NHS, and that they incorrectly believe that less EU migration is a way to get it. .